Made of reclaimed jersey cotton, this infinity scarf puts a fresh spin on the familiar knit. As cozy as your favorite worn-in t-shirt, this infinity scarf puts a fresh spin on the familiar knit. Artisans in Cambodia start with soft jersey-knit cotton salvaged from mass clothing manufacturers. 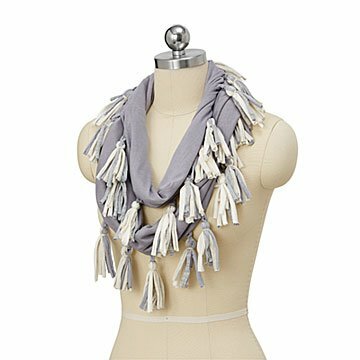 They creatively repurpose every last thread to make this scarf, turning scraps snipped away during the sewing process into swingy tassels and reclaiming would-be waste as stylish, sustainable accessories. Hand-sewn in Cambodia. Learn more about the sustainable story behind this scarf in an interview with the designer on our blog. This scarf had my daughter's name written all over it!